Babenhausen Kaserne http://www.globalsecurity.org/military/facility/babenhausen.htm near Darmstadt in Hesse, used as a repatriation camp for German soldiers and a refugee camp for Slavic Freedom fighters and refugees fleeing the Soviet takeover of their homeland. I am researching my father's history. He left Latvia sometime in 1944 and ended up in Babenhausen Germany in a displaced persons' camp. He came to Australia in 1948 after marrying in Babenhausen. I am trying to find answers to how he would have come to Germany. How did the German army evacuate itself from Latvia in 1944. If he was in the Latvian Army or a partisan group would the Germans have taken Latvians with them or would he have made his own way to Germany and if so how? Just came across this website. I found a whole bunch of pictures that my uncle must have taken during WW II. Many of the backs of the photos are labeled and are of displaced persons camps -- Babenhausen, Lindenfels, Zeigenheim. They are dated 1946 and 47. There are at least 50 of them. The guy sitting down is my Uncle Maurice. He died when I was 15 (and I'm 47) so we never talked about this stuff. Maurice (who took these) kept a diary which I now have. Unfortunately, he was far more interested in talking about what he ate at each meal than the real issues. There are lots of pictures of kids. This one is labeled Miss Anda Pinkerfeld (the great poetess) who appears to be a caretaker or teacher. In the aftermath of World War II, Pinkerfeld-Amir was sent to work in the Displaced Persons camps in Germany by the Jewish Agency. Pinkerfeld-Amir kept a diary of her experiences in Europe. She later worked in the archives of the Ministry of Defense, keeping records of soldiers who fell in the 1948 War of Independence. Hello!! You really have done a great job with your web site and it has helped me understand the beginnings of the aid to refugee programs in post war Germany. Unfortunately, my research is oriented more towards the IRO and in particular, the Headquarters of that organization located in the German town of Bad Kissingen, 1947 - 1949. Can you point me towards any archival sources that discuss this part of the refugee story? To the best of my knowledge, Bad Kissingen had no camp for displaced persons of any size for any duration. This is not to say that something may have existed for a few months following the war, just that in comparison to the major camps, there was nothing of note. I have very little on the IRO period. But my site is a good source for information otherwise about the town in the pre and post war years. In particular, see the Home Station folder and the " Hidden Stories " sections. They give you an idea of what was going on in the middle and late 1940s in BK. Hello Olga, My dad, who died about 10 years ago, was suppose to have been running a DP camp while in the US Army. My brother tells me that the best he can figure out from the materials that he has from my dad was the camp was in "Bad Oeynhausen" in Germany. Any info contact: Andy Iserson Thanks. Reply from Olga: As the war to came to an end, the British soldiers came upon a terrible sight: 60,000 humans in Konzentrationslager Bergen-Belsen, most have hardly the strength to be pleased about the arrival of their rescuers. In the next months, 13,000 humans die of malnutrition, weakness and typhoid fever. 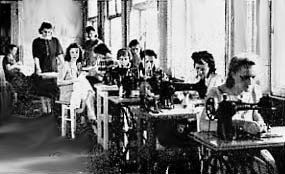 6000 inhabitants, displaced persons, former KZ prisoners and forced laborers were accommodated in barracks near the city, and an undestroyed the health spa became the British headquarters. There was no DP camp in or near Bad Oeynhausen!!! My mother was taken from her home in Przemysl, Poland in 1943 and insured at the "Allgemeine Ortskarankenkasse" Marktheidenfeld; Hasloch. She was registered in Hasloch where she was forced farm labor at Bernhard Verchs. Later she was in Baldersheim, a rural district of Ochsenfurt, resided in house number 62 and gave birth to my sister. Then she was in a DP Camp Schweinfurt and in 1946 in a DP Camp Weiden/Oberpfalz. In 1947 she left Camp Weiden for Amberg. My father was arrested in Radomsk. In 1943 he was sent to Aushwitz. Then in 1943 he was sent to Gusen and in 1943 to Mauthausen, 1943 Weiner Neudorf. In 1945 he was liberated from Mauthausen and he was in DP Camp Schweinfurt, on and in DP Camp Weiden/Oberpfalz. Then in 1947 he left DP Camp Weiden for Amberg, Belguim. Neither my mother nor my father ever talked about this time. I found out these dates through the Red Cross and Holocaust Tracing. Both of them are now deceased and there is no way of finding out any more information about this time. Can you give me any suggestions about who I can contact or hire to try to find out about my mother's life in Germany during her forced labor and my sister's birth there? I would appreciate any help you can give me. Your site is fantastic. You are doing a wonderful job. It is amazing how many people are looking into the past. Bavaria general research not a camp, but lots of research help; Bavaria is called Bayern by the Germans. Note: Bahnhof is not a town but the German word for Railway station. Wolfgang , author of Post der befreiten Zwangsarbeiter - Displaced Persons Mail Paid in Deutschland 1945 - 1949. I was wondering if you could assist me. I am trying to locate information pertaining to Austrian PWs that were held after WWII in the Bayreuth area. I believe they would specifically have been in Bindlach just north of Bayreuth. I have aquired two sketches of a 9th Army Air Force (AAF) Sergeant that are dated 1945 and just outside Bayreuth. I was stationed there in the 80s and collect items from there. I thought these were interesting just because they were from there and that I have a few other items of the 9th AAF which I knew were at the base in Binlach just after WWII. Upon receiving the sketches, I realized that they were drawn according to the signature by an Austrian PW and it also references two other Austrian PWs. One sketch also references the Sergeant favorably which leads me to believe that this Sergeant must have had a good relationship with the artist as well as the others. It is written on the back of one of the sketches, "Our good Mr. Olson", who is the Sergeant in the sketch. I would like to find this artist if possible. I was wondering if you could tell me where to locate lists or archives with the names of the PWs from Germany and the different areas so that I might discover where this gentleman might have been released or taken. I have just begun my search and will contact Bayreuth as well. I plan on going back this year so I hope to see what archives they might have at that time.